VISINE® MAXIMUM STRENGTH Redness Relief eye drops with HYDROBLEND® soothes, restores, and protects red, irritated eyes for up to 10 hours of comfort. So you can enjoy your next late-night streaming binge without the morning after eyes. I slept in contacts and woke up with extremely red and irritated eyes . I immediately reached for eye drops and wore glasses for the rest of the day . I was hoping that the next morning most of the irritation and color would have subdued, however it didn’t . I was concerned and began to look up reviews on different eye drops and came across the max strength visine. I could not be anymore serious but about a minute after applying the drops it just went away . I normally don’t take the time to endorse products but for those that truly need a quick and reliable solution . This is it !!!! Do take into consideration this was a contact related case , I’m not aware of how it would work for allergies but I’m assuming probably just as great . You recently changed your redness relief visine. I use visine daily and noticed the change is a downgrade. It no longer works as well. The previous product worked perfectly. The new one seems diluted or watered down. Will have to look for a new product to use other than visine. Disappointed. Hi there, thanks for leaving your review! We'd like to chat more about your experience and see how we can help, so please give us a call at 1-888-734-7648. We're available from 9am - 5:30pm ET, Monday through Friday. Hope to chat soon! PACKAGING HORRIFIC - I'M SEEING RED!!!!! We're very sorry that you have experienced this with our product. We'd like to learn more about this, please give us a call at 1-888-734-7648 M-F between the hours of 9A-5:30P ET. Thank you and have a great day! Visine Maximum Strength absolutely relieves my red and irritated eyes!! Only Visine works for me~ the very best on the market!! Irritated, dry red eyes happens a lot during Spring. I get so overwhelmed when I dont have my Visine. This stuff really does work the quickest at giving/getting some relief. Best part is, it lasts all through my 8 hour work day! Dryness, red irritated eyes? Get Visine Maximum strength! Works well to get rid of redness. I experience this due to eye problems. I have always used VISINE Maximum Strength eye drops for my red eyes due to either allergies or not enough sleep. Always gets rid of those red eyes without any irritations. 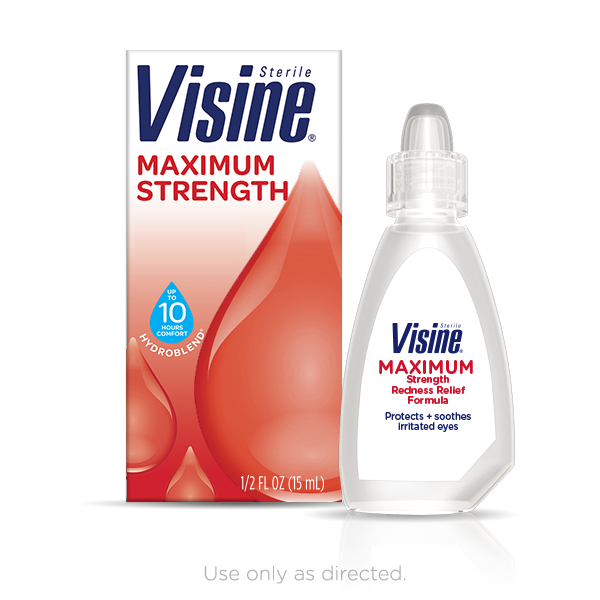 VISINE MAXIMUM STRENGTH Is the absolute best for dry, irritated, red, itchy eyes. I suffer from dry eyes, and I use this product every day. It totally helps me find relief.